Recombumin® is a versatile stabilizer for challenging cell and gene therapy, as well as drug vaccine, processing and formulation. Fantastic purity and safety profiles with a strong documentation package. A well-described carrier protein which is present in high concentrations (40-50 g/L) in plasma, Albumin has a circulatory half-life of roughly 19 days. It has a number of functions, including protein stabilization, the ability to bind both metal ions and to surfaces, fatty acid transportation to tissues, and an anti-oxidative effect in plasma. Albumin is manufactured in hundreds of tons across the globe. This is primarily because its high concentration both in plasma and interstitial space significantly influences the oncotic control of body fluids. This has led to its use over a number of decades as a plasma volume expander. As a result of its wide availability throughout history, albumin use has been established widely in the manufacture of vaccine, drug, and device products for a variety of applications including drug delivery, medical device coating, and formulation. Historically, bovine or human serum has been used to source albumin. More recently, there has been an increased demand for animal-free replacements in the biopharmaceutical industry. This is a result of regulatory concerns over blood-borne contaminants such as viruses, prions, and mycoplasma, as well as the performance variability of the product and the reliability of its supply. Albumedix has consequently used a proprietary Saccharomyces yeast strain to develop a variety of high-quality recombinant human albumins (rAlbumins) which are animal-free. The secure supply of consistent and safe albumin material is ensured by a company with over 25 years’ experience, a number of manufacturing sites, and a reputation as the largest protein manufacturer in the world. Recombumin® Elite and Recombumin® Prime have been developed and optimized in order to provide a safe and stable ingredient which complies with industry regulations for the drug delivery, formulation, and medical device markets. Large-scale facilities are used to manufacture these products to cGMP quality standards, without using human- or animal-derived products. USP-NF* compliant, Albumedix’ rAlbumins are supported by a well-documented safety package, as well as a drug master file. As well as improving efficiency in the delivery of the customer’s final product to market, these quality features allow fast-tracking of the regulatory approval process. By preventing oxidation, adsorption of the active drug, and aggregation, Albumedix’ rAlbumins have been illustrated to stabilize live viruses or proteins. Albumedix’ rAlbumins have been evaluated or approved for use in a large variety of applications. Numerous customers have found it easier and quicker to optimize their product or unique application using rAlbumin. Courtesy of their ease of use and flexibility, customers are able to more quickly develop new, safe products using rAlbumin, as well as being capable of improving existing products at affordable COGs. The development of superior products can be facilitated by Albumedix’ rAlbumins. For instance, rAlbumin is being used by several customers to develop liquid stable protein therapeutics. This is because albumin’s stabilizing effect often exceeds that conferred by conventional sugars, amino acids, and detergents (SADs). Albumedix’ rAlbumins have provided ease of approval, security of supply, and customer product superiority in the medical device sector. This has allowed the reliable commercialization of products by partners with repose regarding key component availability. Recombumin Elite is manufactured in an entirely animal-free facility and expressed in a proprietary Saccharomyces cerevisiae (baker’s yeast) expression technology. Strict quality requirements are considered during its manufacture. Recombumin Elite has been developed and supplied as an ingredient which aids the manufacture of advanced cell and gene therapy products, as well as pharmaceutical drugs. Customers’ applications are provided with unprecedented performance and quality benefits by Recombumin Elite. Recombumin prime is the globe’s first GMP manufactured, animal-free rAlbumin which was developed specifically as a vaccine and drug manufacturing ingredient. The only product of this kind which is currently commercially available, it is also expressed in Saccharomyces cerevisiae. Already used in the development of the EMA- and FDA approved MMRTM II childhood vaccine delivered by Merck and Co, Prime has been approved to be used in manufacturing human therapeutics. The desire to reduce development costs while accelerating the length of time taken to get products to market creates pressure to decrease production and processing times in the biopharmaceutical industry. 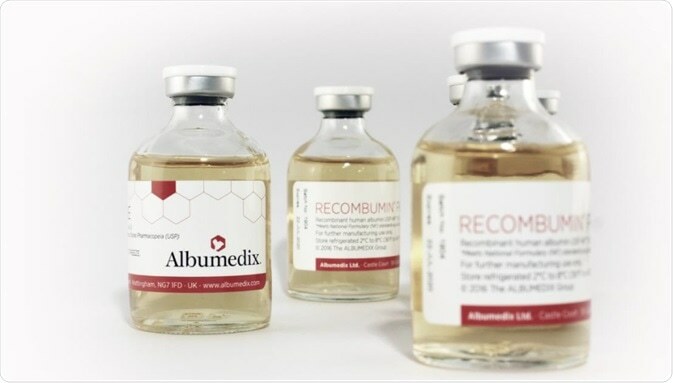 Albumedix’ rAlbumins conform to regulatory standards and provide a secure supply of batch-to-batch consistency, courtesy of their established pathway through the regulatory approval process. Processing and testing times are reduced by this regulatory compliance and consistency, driving product efficiency for customers searching for a compliant alternative to albumin. Albumedix has a commitment to providing experienced product, regulatory, and technical support in order to meet the needs of its customers. Boasting over 20 years’ experience working together with albumin and regulatory agencies such as EMA and FDA, their committed manufacturing, regulatory, and R&D teams can provide unrivaled support for product design and customer applications. They are also able to ensure quicker and improved registration of customer products. Our albumin-based technologies offer new ways of optimizing drug dosing and enhancing therapeutic performance by increasing the half-life, payload capacity, and tissue specific delivery of active pharmaceutical agents. This results in simpler treatment regi¬mens, better performance, and, ultimately, improved patient outcomes.